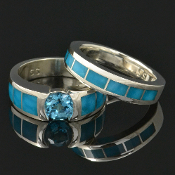 We offer handcrafted matching bridal sets featuring turquoise, dinosaur bone and opal engagement rings with wedding bands inlaid with matching stones in sterling silver, gold and platinum. 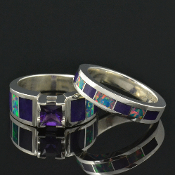 Our engagement rings are available with center stone options such as diamond, Moissanite, topaz and sapphire accented by colorful dinosaur bone, turquoise, sugilite, lab opal and many other unique stones. 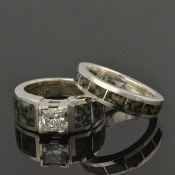 All of our rings are made to order in your ring size in 4 to 6 weeks and may be customized for your favorite stones and budget. Metal upgrade options include Continuum sterling silver (tarnish resistant), 316L stainless steel, white or yellow gold, and platinum. 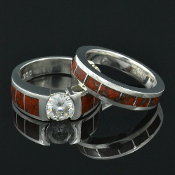 Contact us with your ring size for a price quote for the upgrade. 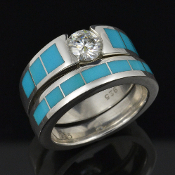 The rings shown may be inlaid with any of the materials you see on our website so don't feel limited to only the colors shown in the rings here.